I don’t think that my good friend, Lisa Graley, a professor of Humanities at the University of Louisiana at Lafayette, will mind if I publish her ideas about a fascinating subject she teaches in a Humanities class called “Magic Realism.” Lisa, a writer and poet, has a highly creative mind and recently asked her students in this class to create ex-votos, an art form represented in symbols, paintings, and texts which act as votive offerings to saints or divinities from persons who are grateful for miracles that have occurred in their lives. Ex-votos often take the form of a painting that expresses faith and healing – they’re personalized thanks for healing or restoring of health; e.g., some famous ex-votos have been displayed in the church of Notre-Dame-de-la-Garde in Marseille, France and include paintings, plaques, model boats, war medals, and other objects. Lisa says that her students meditated on a time “when they had been ‘saved’ from a tragedy or recovered from sickness (or made a B in algebra!) and created ex-voto paintings in gratitude for the ‘miracles.’” They also included on their paintings a “banderole,” which explained the problem they experienced and how they were saved. She says she gave her students a lot of latitude to do these creations. “One of them, for instance, was just thankful to St. Cecilia for ‘the blues that mend the breaking heart.’ He painted St. Cecilia and then a guitar player under her.” Students sometimes created images after the art of persons like Frida Kahlo, the famous Mexican artist. 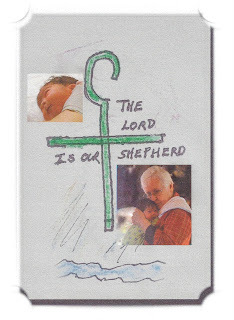 Poet laureate Darrell Bourque brought in several ex-votos from his collection that represented the offerings made by people who had been saved from floods and various poxes, as well as from alcoholism. Another English professor, Marcia Gaudet, brought in one that represents a man who was saved from a bad fall from his tractor. “Most of those brought in were from a Mexican tradition; hence the relationship with Kahlo,” Lisa explained. She also added that since these paintings were done in primitive style, no one was intimidated about doing the art work . The assignment was so intriguing that Lisa created one herself. A devoted Protestant, she thanked God (not a saint) for delivery from a tailspin in her car that occurred because she had taken her eyes from the road to glance at a descending spider in the car. She went off the road, came back on the highway, slammed on the brakes, and the car spun and spun, then ended up facing the opposite direction in the other lane. Lisa’s ex-voto was a painting of the spider coming down in the car and the car spinning around in the road. She wrote an explanation of the near-tragedy, creating her ex-voto on the back of a piece of paneling, priming it well. Her long e-mail about the students’ ex-votos inspired me to meditate about a miracle that occurred in my own life and to think of how I would render an ex-voto. The most immediate miracle that took place in my life was the one concerning the birth of my great-grandson, Alexander Charles Romero. I thought about the day I arrived in Covington for his birth and my daughter, Stephanie, who was already at the hospital, telephoned me approximately thirty minutes before his delivery. She told me that the baby was in distress and his mother, Kristin, would have to deliver by caesarean. Stephanie’s words to me were: “pray, Mama.” When I hung up, I felt pangs of absolute terror, which were followed by the notion that Stephanie had said the words needed for the situation – “praying” was called for. So I repeated the 23rd Psalm over and over, and within moments I experienced a feeling of peace. My terror dissipated in an intuitive “knowing” that Alexander would be fine. By the time I arrived at the hospital and peered through the glass window of the nursery, “Alexander the Great,” (as I call him) had entered this world and was snoozing peacefully. He remains a peaceful baby, fussing only when hungry or when he has eaten too much as he has a voracious appetite. 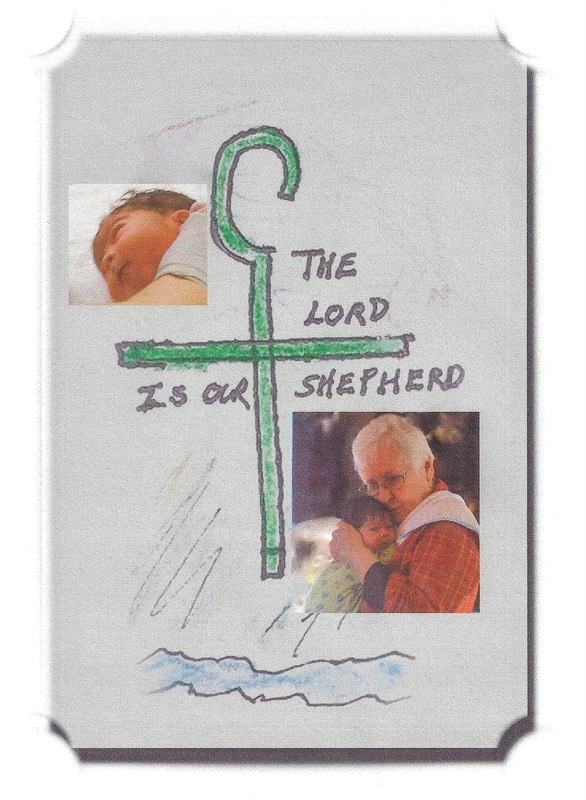 I have an idea for the ex-voto which I’ll try to draw on this blog – a shepherd’s crook with a photo of Alexander and me snuggling, accompanied by the message: “The Lord Is Our Shepherd.” It’s a pretty primitive rendering, but the emotions attached to this “miracle” are extremely powerful. And Lisa did give permission for people to create primitive drawings by presenting the Mexican renderings. If you search for ex-votos on the Internet, you’ll find some wonderful images and paintings, and if you’re as taken with the idea of ex-votos, as I was, you may want to create your own. I plan to superimpose my drawing/photo on wood when I can take time away from the novel entitled Redemption that I’m presently writing. And thanks, Lisa, for telling us about your intriguing exercise. I can see why you were selected to be an outstanding teacher of the humanities at ULL last year. No March winds blew us back to Sewanee. Last year when we returned to Sewanee during March, the wind roared around our cottage and snow fell several times before Spring arrived. This year, the Mountain endured a severe winter, but daffodils and forsythia already fill the woods. The beautiful white pear trees that a friend of ours calls “lollipop trees” have begun to blossom, and yesterday when we drove to Cowan, Tennessee, we glimpsed stands of them along the highway. The mild temperatures have surprised us the most – this morning, our front porch thermometer registered 68 degrees, and “Grayville,” as I sometimes call Sewanee, is radiant with sunshine. My backyard garden shows the drabbest scenery. Two beds that flowered with yellow and orange lantana last summer contained dry, tan sticks that I pulled up yesterday. 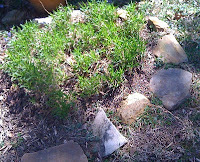 However, a small bed of dianthus hung on during the winter and boasts a struggling patch of green. So I go out on the porch and keep my eyes fixed on the leafless woods in the front yard where “stalwart spears of daffodil [are] uncovered,” as the poet Marge Piercy says. Yesterday, I found a packet of chives seeds lying on the buffet in the dining area of our cottage. Armed with a small trowel, I went out to test this early Spring by planting the seeds, daring a last frost to descend and kill them off. Chives thrive in warm soil and strong light, and the light is abundant but who can predict the temperature of soil in my back yard beds? Garden experts tout that “knowing how to grow chives is as easy as knowing how to chew bubble gum,” but they don’t take into account black thumbs like my own that kill off rose and gardenia plantings (I also had to pull up a dead rose bush yesterday). Another gardener says that learning how to grow chives is easy enough for a child, so I’m encouraged about my early gardening and feel as though I’ve helped accelerate Spring on The Mountain by planting the expected clump of chives. However…this morning, when I looked out the kitchen window, I surprised a fat squirrel digging in the bed where I planted the chives seeds, and my botanist friend informed me that squirrels love to dig up varieties of seeds. Here we go, I thought. The deer are next, and the moles have already arrived to pockmark the lawn again. Our front yard at Sewanee borders the woods, and we have left the lawn a mossy expanse, but we fight valiantly for space in which to cultivate flowers in the back yard; each act of gardening and yard grooming overshadowed by wildlife foraging. Perhaps the squirrel missed a few seeds, and I’ll be able to harvest the chives. I’m waiting for them to achieve a foot in height so I can cut them back to half their size. Maybe the plants will actually flower, and I’ll be able to decorate soups and salads with the blooms. 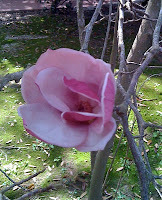 The dogwood trees haven’t begun to leaf, mornings are nippy, and if we can get past Good Friday without a frost, I’ll revise my thoughts about the former half-heartedness of Spring on The Mountain. Meanwhile, I find tiny orange and black ladybugs on the window sills throughout the house -- a certain sign of the metamorphosis of Spring. We received word that air conditioners have already begun to churn back in Louisiana and that we left bayou country just in the nick…Here, the woods are waiting in silence for the dogwoods, and the mild Spring is a glad surprise. One of the publications that comes to me each month, courtesy of a friend, is a magazine entitled "Science of Mind," which has nothing to do with my Anglican identity, but which has given me much spiritual insight, and, at times, provides me with fodder for sermons. In December, the magazine published an issue about the blessings of the season and the power of gratitude, and this morning while clearing out papers and periodicals for my inevitable transfer from New Iberia, Louisiana to Sewanee, Tennessee for a spell, I discovered the issue, just in the nick of time for Lenten resolves. Since I am slightly overweight, I suppose that I should be giving up food and an occasional glass of wine, or some physical comfort. During the 1940’s Evelyn Underhill , the great Anglican mystic, who resided in England where temps are often frigid, advised her Lenten retreatants to give up warm baths, hot water bottles, and other creature comforts. Although I love Underhill’s works and quote from them frequently, I don’t believe in the kind of physical austerity that characterizes many of her Lenten rules. My preference is toward cultivating some practice or reading, some affirmation of life that has been lacking in my personal life and in my relationship with others during this time of reflection and prayer. The German theologian Helmut Thielicke once said that "American Christians have an inadequate theology of suffering,” and perhaps he’s right, but I prefer a more positive theology like the one put forth in the magazine mentioned above. You can give up chocolate if you want to, but I think I’ll use affirmative prayer and gratitude during this season. A good start would be to begin the day with the sentence, “I am thankful for my life because…” I can frankly say that I don’t start my day in that manner, and this “fill in the blanks” affirmation would be a good discipline for me. That’s my idea of enlarging my spiritual life during Lent. 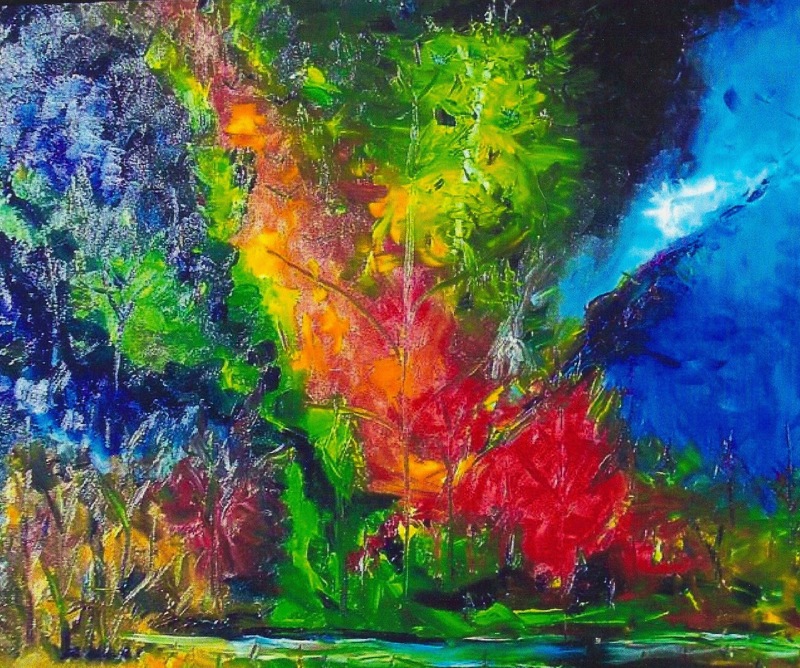 The painting above is an explosion of color that, to me, symbolizes a burst of gratitude. It was rendered by my brother Paul who lives in northern California. 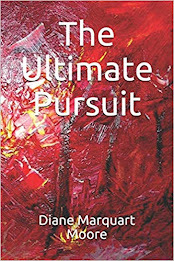 I'm grateful for his painting talent as many of his renderings appear on my blogs and on the cover of some of my books. Spring! Or at least false Spring! And I’m among the fortunate people who enjoy two Springs – one in south Louisiana and another on The Mountain in Tennessee. 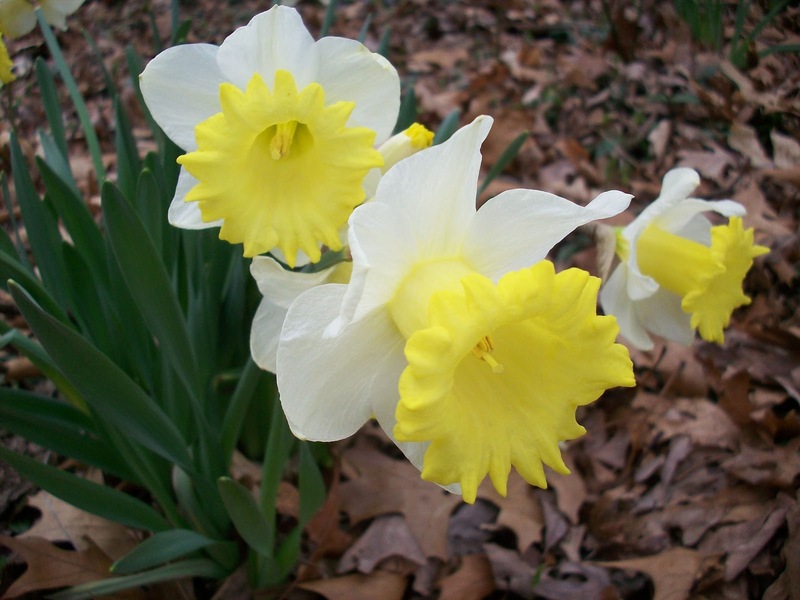 Deep pink camellias, white and purple azaleas, and the Japanese magnolia trees have begun to bloom here, but I hear from Sewanee friends that only the daffodils are flowering in fields on The Mountain. By the time I arrive in Tennessee this month, we may even see more snowfall; however, by April, the forsythia, dogwood, wild azaleas, and rhododendron will flourish. A few nights ago, I watched a poet read on national television and heard him talk about how, as he grew older, his poetry became less and less, or in literary lingo, he had become more of a minimalist – a “less is more” kind of poet. He reminded me of my own feelings about compressing words into poetry as I live through my seventh decade. 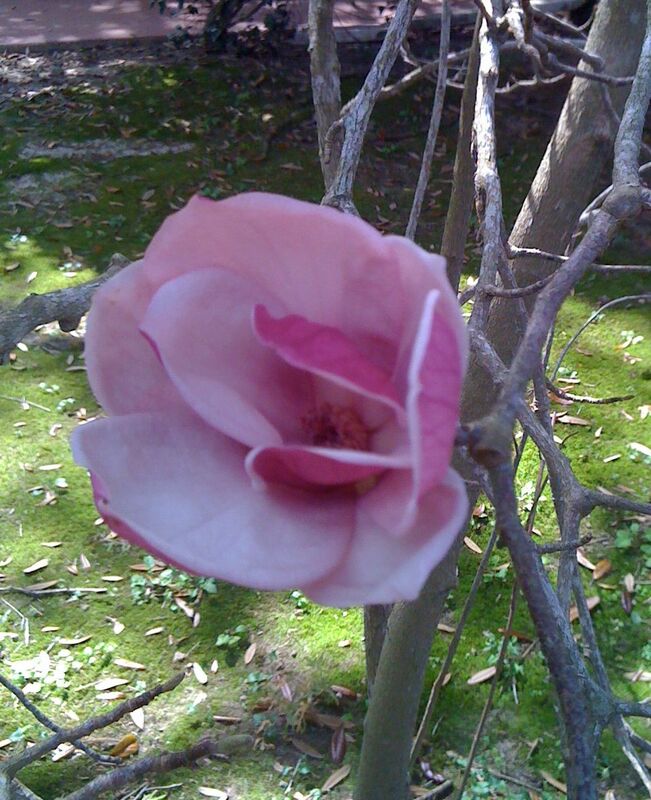 Since I experience two Springs, I think of long poems to celebrate the wonder of another season of renewal, but when I sit down to write, the words are compressed into simple lines about birds, camellias, clover…and short titles announce them. to the evolution of human soaring. As Spring arrives here in “The Berry” (New Iberia), I’m certain of two things – the older I become, the lovelier the renewal of the natural world appears to be…and the sap of poetry runs deeper.